trying to top last year's second-place finish at State. Hales Franciscan is, bar none, the top team in Class A. Westinghouse received some more talent in the backcourt via transfers to go with the state's premier big man. And Glenbrook North has the most dominating high school player in the state. But it is Hillcrest, which went through the summer unscathed, that garners the preseason No. 1 spot by HighSchoolElite.com. With a great mix of talent, chemistry, players who know their roles and solid coaching, the Hawks are the team to beat heading into the 2004-'05 season. Hillcrest – The best backcourt in the state of Illinois just knows how to win, as Hillcrest went undefeated with a very tough summer schedule. Seniors Maurice Acker, 5’9” point guard, and Jerel McNeal, 6’3” wing guard, may or may not be the most talented duo, but they certainly have the best chemistry and do whatever it takes to come out with a “W”. McNeal is headed to Marquette and Acker decided on Ball State. Senior power forward Reggie Bossie at 6’3” is also a big part of why this team always seems to overachieve. Bossie plays like he’s six inches taller and has great basketball instincts. Add in Marian Catholic transfer Ryan Owens, a 6’3” small forward, and this is a tough team to handle. Hales Franciscan – Yes, they are a Class A team (small school), but they are still one of the best in the state. The Spartans have two players that are usually money in the clutch in 6’3” senior Nate Minnoy and senior shooting guard Mike Robinson Their junior point guard, Jerome Randle, is one of the quickest point guards in the country with the ball in his hands. Add in 6’6” senior forwards Austin Chapital and Jeff Wilson and there’s a winning formula. With the already-strong nucleus, Morgan Park transfer Darrien McKinstrey, 6’0” junior, can be added to a very talented mix. Westinghouse – Boosted by Proviso West transfers Joe Ballard, Kris Harris and Marquis Johnson, “The ‘House” will make a strong run at the state title. With 6’8” center DeAndre Thomas holding down the middle and great guard play with such names as Corey Caston and Jimmy Hill this is the team to beat in the city. Glenbrook North – It has been said this team is just slightly above average without super junior Jon Scheyer (6'5", G), and that may be true. However, with him this team will make things happen. As a freshman Scheyer led his team Downstate. His stock has dropped somewhat nationally this summer, but rest assure when the high school season comes along he’ll still be dropping 40-point games on defenses solely designed to stop him. Also watch seniors 6’1” point guard Sean Wallis and 6’6” forward Malick Valliani, along with 6’6” junior power forward Zach Kelly. Homewood-Flossmoor – Kansas-bound Julian Wright and point guard/star quarterback Freddie Barnes, who committed to Bowling Green for football, are the only returning starters, but the Vikings regroup quickly with bench players from last year and big men from the sophomore team. Most notably, look for senior D.J. Posley (6-1, PG) who has emerged this summer as a star in his own right and is committed to Indiana-Purdue Fort Wayne. Despite a frail figure, he is a defensive force, can knock down the mid-range jump shot and is very smart on the court (and in the classroom). Look for emerging juniors guard Marcus Relphorde, forward Andre Walker and center Carl Hayes. Julian – Young, but very talented. Look for a lot to be asked of Brandon Ewing (6’1”, PG, Wyoming). Coach Loren Jackson is emerging as one of the Public League’s finest coaches and will lead 6’5” junior DeAngelo McIntosh, 6’7” junior Thijan Moses and 6’8” sophomore Mac Koshwal. The eligibility of Moses and Koshwal is being looked at by the IHSA. Super sophomores Jeremiah Kelly and Thornwood transfer Trey Blue can both light up the scoreboard. Look out for the emergence of 6’8” senior big man Desmond Hendrix, another transfer. Carbondale – This team already has experience from a fourth-place finish in the Class AA playoffs last season, but the addition of two transfers helps bolster their already strong lineup. The Terriers lost Justin Dentmon to graduation, but Century transfers Josh Tabb (Southern Illinois) and Ray Nelson will fit nicely into the mix. Returning players include junior post Manual Cass and guard Phillip Fane. Morgan Park – This team’s downfall could be the lack of a go-to-player in the clutch. However, they have size and above-par players at every position. Six-foot-8 center Jimmy Covington leads a talented group of seniors. Kenyale Evans, Raphael Scott and Halston Hallman will also provide senior leadership. Watch out for 6’9” sophomore power forward Isaiah Martin and immensely skilled junior Brandon Bouche. Thornton – This team’s size and strength will be hard to contend with. Led by 6’6” junior forward Joevan Catron. The post will also be anchored in by senior athlete extraordinaire Donnell Lyons. Emerging junior Jamel McClean moved to Virginia but rumors say he could be back for his senior year. Brandon Dagans (6-1, SR) is a shooter supreme in the backcourt and the team’s top returning scorer. The IHSA is looking into the eligibility of Rich Central transfer Brandon Long and Crete-Monee transfer Mustapha Farrakhan. Bloomington – As it stands, post player Wesley Ware is still nursing an injury suffered during the football season, and the Purple Raiders are very small in the post with an undersized club. However, the Illinois State-bound backcourt of Dodie Dunson and Brent Holtz will certainly keep this team a force. Add in sophomore post Lonnie Lawrence and sophomore guard Justin Bocot and this team may surprise some people. St. Joseph – This is a recruiting spot most all DIs will want to familiarize themselves with for the next three years with a near top-10 level prospect in each of the next three classes. It begins with senior 6’1” Iowa-bound Tony Freeman, ends with 6’4” sophomore Demetri McCamey and has 6’4” junior Jon Peoples in the middle. Emerging sophomore Evan Turner is not expected to begin the season on varsity, but could make an impact latter in the year. Proviso East – Senior guard Phillip Perry has been a starter since his sophomore year and has been in the presence of some great players who went onto success in the Big 10: Shannon Brown at Michigan State and Dee Brown at Illinois. Now, it's Perry’s turn, as he committed to Wisconsin. Indiana-State-bound Jerimiah Wise will be in the backcourt with Perry, while 6’10” junior Brian Carlwell will hold down the middle. Senior swingman Marcus Scott is strong, skilled and plays very physical. 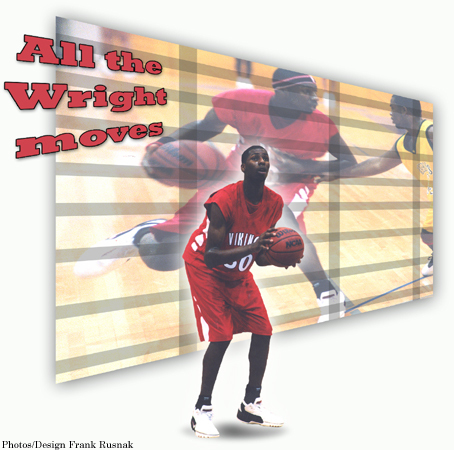 Look for sparkplug Sergio Brown, 6’0” junior guard, to be the fifth starter or a super sixth man. Simeon – Young, talented, hyped. You can go on and on about Derrick Rose and the talented, yet inexperienced Simeon ball club that will be one of the state’s top teams for the next three years to come. Led by the 6’3” Rose, this talented nucleus of sophomores has 6’5” post Tim Flowers, 6’3” wing Bryant Orange and 6’4” Whitney Young transfer Kevin Johnson. Look for senior point guard Tim Green, a two-year starter, to provide experience. And, an emerging player off the bench will be junior point guard Carl Hampton along with 6’4” junior Josh Davis. Belleville Althoff – The leader of this team is certainly St. Louis-bound Kevin Lisch. However, he is surrounded by some nice size and talent, which include 6’6” juniors Brandon Roth and Ryan Gore. Sophomore Jeremy Felton will be a nice inside-outside scoring threat. Watch for Kevin’s younger brother, freshman Daniel, to also make a name for himself. Rockford Jefferson – With a college-like front line going 6’9”, 6’8” and 6’6” the J-Hawks will prove to be an intimidating foe for most opponents in the NIC-9. Ball State-bound center Pat Nelson has elevated his game along with junior power forward Robert Eppinger, who has shown great versatility with his skills. Small forward Matt Peterson is athletic and has a nice touch from outside. The key may very well be junior point guard Brandon Fisher, who did not play last season because of academics. Farragut – The leader of this team is one of the Public League’s best, junior point guard Chris Singletary. Singletary is experienced, under control with the ball and has a talented group surrounding him. Senior power forward Johnny Logan is strong and can throw his body around. Look for Logan to receive help from 6’7” freshman Mike Dunnigan. Prosser transfer Cory Hughes is a threat at either guard position. Crane – The trio of senior forward Tyrone Kent and juniors Sherron Collins and Darius Walton are what make the Cougars tick. An athletic, high-scoring team, coach Anthony Longstreet will have this squad going from start to finish. Moline – Coach Frank Dexter can never be doubted, and this year is no different. Led by junior sharpshooter Paul Bayer, this team will likely set the tone for in the Western Big Six. Also watch for junior post Brandon Carleton. Marist – Juniors Jeremy Nash (6-4, WG) and Mitchell Bouie (6-4, F) are the unquestioned leaders, but senior Jim Griffin is a multi-dimensional player at 6’7”. Also look for Tom Sullivan, the team’s top scorer from last year, to make some noise. Von Steuben – Senior guard Angel Santiago is a four-year starter and has the experience on the court to lead this young team. The junior combination of Jeremie Simmons and Kendall Russell are both emerging prospects. Senior point guard John Johnson and senior forward Paul Warren will both put points on the board. Look for sophomore guard Michael Horton to give the Panthers a spark off the bench. Rich Central – One of the area’s top combo guards, Brandon Long, transferred out (to Thornton), but replacing him is Rich South transfer Jeremy Winters. Winters is a 6’1” senior who is an explosive athlete and flat-out winner. He will team with 6’4” Mississippi State-bound Jarvis Walker, 6’2” sophomore Justin Taylor and Crete-Monee transfer Howard Little. Harlan – If all the pieces align, this could be the state’s top team, but on the same token, they could fall apart and dismantle themselves. Seven-foot big man Clarence Holloway (Louisville) has been out of action for a while, whether it be sickness, ineligibility from transfer or injury. Jeremiah Bryant was ineligible for all of last year after his transfer, along with Holloway, from Chicago Fenger. The key for this team will be 6'5" junior wing guard Andre Gullens who has elevated himself to high-major status with sterling performances this summer. Also watch for senior guards Jabbarie Brown, an explosive athlete, and Lamont McCall, a pin-point shooter. Leyden – Marcus Green has improved his game perhaps more than anyone else in the state since the start of his high school career. Next year he will take his prodigious skills to Purdue, but before he goes he has high hopes for his senior year. Brown University-bound center Aaron Jimenez will help Green redeem Leyden from a disappointing season last year. Proviso East transfer J.P. Stanback will provide a steady ball handler and senior guard Jimmy Arce can light it up from outside. Civic Memorial – The junior combination of 6’1” point guard Stephen Jones and 6’5” small forward Dustin Maguire are more than any opponent can handle in the Mississippi Valley. Add in transfer guard Michael Elliott and the Eagles could make some postseason noise. Downers Grove South – The Mustangs are led flawless point guard Bryan Mullins, headed to Southern Illinois. Look for versatile junior Elliot Engelmann and rising sophomore Colin Ruben to also make an impact.